Sooo Nerdz if your internet connection for gaming is a bit slower on Wednesday blame Wal-Mart and Amazon. The two retail giants are expected to go head-to-head offering massive discounts to online shoppers throughout the day. Amazon fired the first shot in the online sales war, announcing last week that to commemorate its 20th birthday it would be offering a global shopping event on its Amazon Prime service with “more deals than Black Friday” in a bid to attract more Amazon Prime subscribers. The company has said it’s planning to offer new sales as often as every 10 minutes on the day. But what started as an honest bid to increase revenue and market share has turned into an online retail battle for the ages, thanks mostly to Wal-Mart’s track record of direct confrontation with competitors. 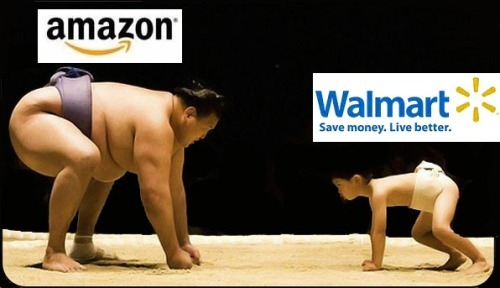 In a blog post published on Monday – complete with a confetti-strewn banner – Fernando Madeira, president and chief executive officer of Walmart.com, announced that the company will be crashing Amazon’s birthday party by launching its own online sales extravaganza, offering “thousands of great deals” simultaneous to Amazon’s own promotion.